The oval or circular scaly patches indicate a skin condition known as diabetic dermopathy. Most people with diabetes already know that high blood sugar can cause health complications that affect your eyes, kidneys, heart, blood vessels and nerves. But far fewer know that high blood sugar can also affect your skin. In fact, some skin problems are often the first symptom of high blood sugar. Here are five of the most common diabetes-related skin conditions, how to identify them and what you can do to treat them. Diabetic dermopathy is characterized by light brown, scaly patches on the skin, most often seen on the front of the legs or shins. These oval or circular patches are often mistaken for age spots. It is estimated that approximately one-third of those with diabetes will experience diabetic dermopathy at some point in their life. It is likely caused by a reduced amount of circulation to the blood vessels in the legs. The patches typically do not cause any pain or itching and therefore need no treatment. They often will go away on their own, especially if blood sugar levels are lowered. Though diabetic-related blisters are rare, they can occur, especially when blood sugar levels are high. The blisters most frequently are seen on the fingers, hands, toes, feet and occasionally on the legs or forearms. The sores have the appearance of burn blisters and occur most often in people with diabetes who also have neuropathy, or nerve damage, due to consistently high blood glucose levels. The blisters can be large but are usually painless and typically heal by themselves within 3 weeks. The primary means of treatment is to lower blood glucose levels. Eruptive Xanthomatosis is also caused by blood sugar levels that remain consistently high. 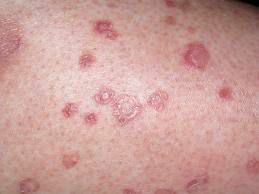 This condition is characterized by firm, yellow, pea-like bumps on the skin that are encircled by a red halo and itches. These bumps are most often seen on the back of the hands, feet, arms, legs, and buttocks. Those most likely to experience this diabetes-related skin condition are young men with type 1 diabetes who also have high cholesterol and fat (triglycerides) in their blood. The condition tends to disappear when blood sugar levels are lowered. Some people with diabetes develop a condition called digital sclerosis where their skin becomes tight, thick and waxy on the back of their hands, on the toes and sometimes on the forehead. Fingers may also become stiff. This condition is common to people with type 1 diabetes, affecting about one-third of at some point during their lifetime. Again, the only treatment is to bring blood glucose levels down. One complication that commonly occurs with diabetes is atherosclerosis, which is the thickening of the arteries that lead to various parts of the body. Atherosclerosis narrows the blood vessels and therefore reduces the blood flow through those arteries, especially to the legs. This narrowing of the blood vessels can cause changes to the skin. The skin on the areas that are not getting enough blood circulation (such as the legs or feet) often become hairless, thin, cool and shiny. The toes may also feel cold. As a result of the poor circulation to the feet, minor scrapes, blisters or small cuts to the feet may be very slow to heal or even develop into an infection. It may be accompanied by a tingling sensation in the feet or possibly a lack of sensitivity to pain, pressure, heat or cold. These are all signs of poor circulation and possible nerve damage (neuropathy) and should be discussed with your doctor.